Undertaking studies that will boost the knowledge and skills of Taranaki farmers are the focus of a new trust set up to oversee dairy industry research in the region. Dairy Trust Taranaki (DTT), comprising the incorporated society which operates the Stratford Demonstration Farm (SDF), the trust which operates the Waimate West Demonstration Farm (WWDF) and the Taranaki Agricultural Research Trust (TART) which leases a commercial farm and the 126-hectare Westpac Taranaki Agricultural Research Station, came into being on December 1. The two trusts and the incorporated society, which have been working together to establish DTT for 18 months or more, are now in the process of being wound up. While the formation of DTT might cause only a ripple nationally, for Taranaki it would become a significant asset. Its trustees were decision-makers who would lead and steer the new entity for the good of Taranaki dairy farmers, he said. The two demonstration farms were established almost 100 years ago by local farmers wanting a model dairy farm in their area to develop and promote better farming methods. WTARS replaced the Normanby Research Station established in 1974. 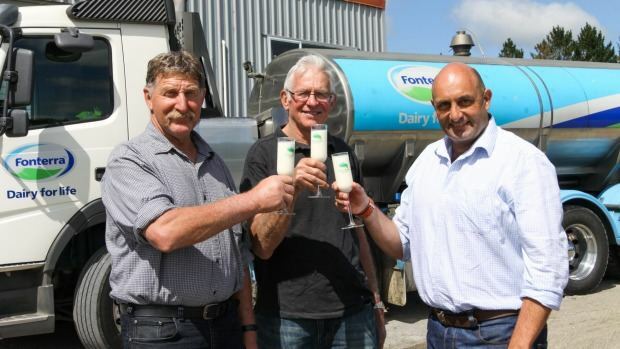 Kiwi Dairies chairman John Young, deputy chairman Harry Bayliss and director Philip Luscombe led its move to company-owned land near the dairy co-operative’s Whareroa site and promoted the establishment of the trust in 1992. Attrill said under the leadership of newly-appointed regional science co-ordinator Debbie McCallum who would be assisted and supported by WWDF and SDF farm supervisors Joe Clough and Graeme Pitman, DTT would now set about creating a clear research strategy for the region. That would allow time for a research programme to be put in place for the 2017-18 season. “In Taranaki we do it our way – the province has always been like that.” Attrill said. An example of the industry’s visionary approach in Taranaki was the 1963 merger of the Kaupokonui and Joll co-operative dairy companies to create Kiwi Dairies and the new company’s revolutionary decision to centralise its processing on one site at Whareroa, near Hawera. Opened in 1972, the Whareroa site was at one time the world’s largest dairy manufacturing site. Attrill said DTT recognised agricultural research had been undertaken in Taranaki for 100 years and would ensure future study conducted here would be relevant to the region. Its creation attracted unanimous support from the region’s dairy farmers. DTT would have one of the biggest science platforms in New Zealand and would conduct sustainable regional research that would enhance the profitability of dairy farming in Taranaki and beyond by creating value in the areas of research, education and demonstration of up-to-date farming methods. “It’s exciting times, but in this low milk price environment we have to have sharp business skills and to be careful with the resource that we have built. “DTT will give us a platform to grow, to do research that Taranaki farmers want and to fit into DairyNZ’s strategy for identifying and conducting research in the province,” he said. Without DTT, the future of dairy industry research in Taranaki would have been at risk because the three entities were so small that attracting funding for them was difficult. With more than 200 years of history behind it, DTT would establish a co-ordinated research programme with a strong interface with DairyNZ. Previously the organisations didn’t know what research was being done on each other’s farms until it was under way. DTT would allow research in the region to be co-ordinated and the different locations, climate and geography of the three farms would allow comparative trials to be undertaken. Taranaki was well-suited to dairying, with its free-draining, fertile, volcanic soils, fast-flowing streams and temperate climate. Fischer said land set aside in 1885 for a school of agriculture for the North Island was taken over in 1918 for the WWDF by a group of farmers who wanted to demonstrate best farming practice. In 1961 a relationship established with the Department of Agriculture led to ground-breaking research on the farm, including into the use of magnesium supplements to prevent metabolic diseases. Fischer said he thought those farmers who set up the demonstration farm would be proud their vision had led to DTT, which would take what they had envisioned a century ago to a new level. In recognition of the historical legacy of the three entities, the Stratford and Waimate West demonstration farms will retain their names. The research station will be known as the Gibson Farm and the Whareroa Research Farm to be leased by DTT next season will be known as the Kavanagh Farm. The names recognise the previous owners of the farms, which were bought by Kiwi Dairies. “It’s important to keep those links – without getting too parochial,” Fischer said. The three organisations’ independence had led to fragmented dairy industry research in Taranaki. DTT would ensure research would continue in the region and that it would benefit the wider industry. He thought all those farmers who had established and been associated with the two demonstration farms and the research station would be extremely proud of DTT and its vision for continued research relevant to Taranaki. Ground-breaking research into the dairy industry has been conducted in Taranaki in the past, including cows’ feed efficiency conversion, comparisons between the efficiencies, economics and environmental impact of high-input and low-input feed systems and the profitability and environmental sustainability of growing crops on the dairy platform. DTT farms 300 hectares, milks about 900 cows, employs or contracts 8.5 fulltime equivalent staff and owns assets worth $4.5 million, including about 290,000 Fonterra shares, livestock and machinery. Their significant equity provides a solid foundation for the new venture. DairyNZ manages the two research farms and Taratahi Agricultural Training Centre manages the two demonstration farms. Each entity will have three trustees on the new trust. They are: WTARS, Brendan Attrill, Duncan Johnston, of Waitotara, and DairyNZ senior scientist John Roche; SDF, Graham Robinson, of Inglewood, Brian Hockings, of Bell Block, and Paul Kuriger, of Opunake; WWDF, Roger Landers, Steve Poole, both of Kapuni, and Lloyd Morgan, of Rahotu. Fischer is retiring. Fonterra, South Taranaki District Council, Taranaki Regional Council and Young Farmers will also have seats on DTT.